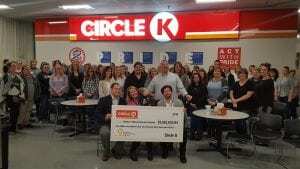 On Wednesday, December 5, the Circle K Midwest Division’s Westhill office hosted a check presentation on behalf of Children’s Miracle Network (CMN) Hospitals. 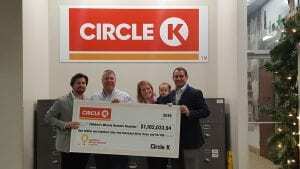 The following Circle K business units: Heartland, Great Lakes, and Midwest, raised $1,162,033.94 for CMN Hospitals this year. Riley Children’s Foundation, representing Riley Hospital for Children, the only CMN hospital in Indiana, sent staff to attend the event as well as a Riley family. Riley Children’s Foundation extends their gratitude to Circle K for raising funds on behalf of Children’s Miracle Network and Riley Hospital for Children. Next post: Together We DID.